Last night I got a text from my friend Jess at 11:45pm that read, “Meet me in Museumplein in 5 minutes.” It was late and I was already in my pajamas, but Jess and I often hang out at unconventional times (Sunday night cups of tea at 10.30pm are kind of our thing), and to be honest, I didn’t have much else on my Tuesday late-night agenda other than sleep. So I threw on my Chucks and grabbed my camera, intent on photographing the cute Miffy Bunnies currently residing in Museumplein. Little did I know, something a way more photo-worthy was in store. 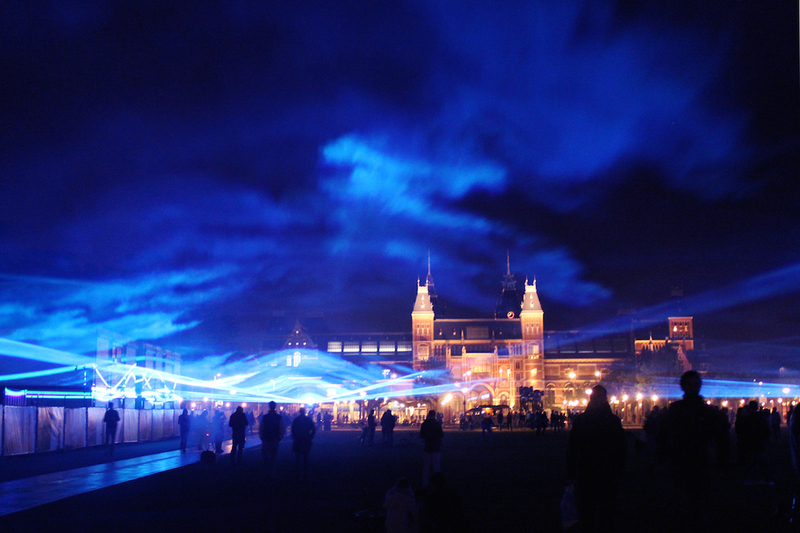 As I rolled up to the Rijks, the sky was illuminated by a blanket of blue. I called Jess right away, wondering where she was and what the heck was going on! Apparently, the Rijks has just purchased a new painting, titled ‘De doorbraak van de Sint-Anthonisdijk bij Amsterdam’ which roughly translates to ‘The breakthrough of St. Anthonis Dike in Amsterdam’ which was created by 17th century painter Jan Asselijn. 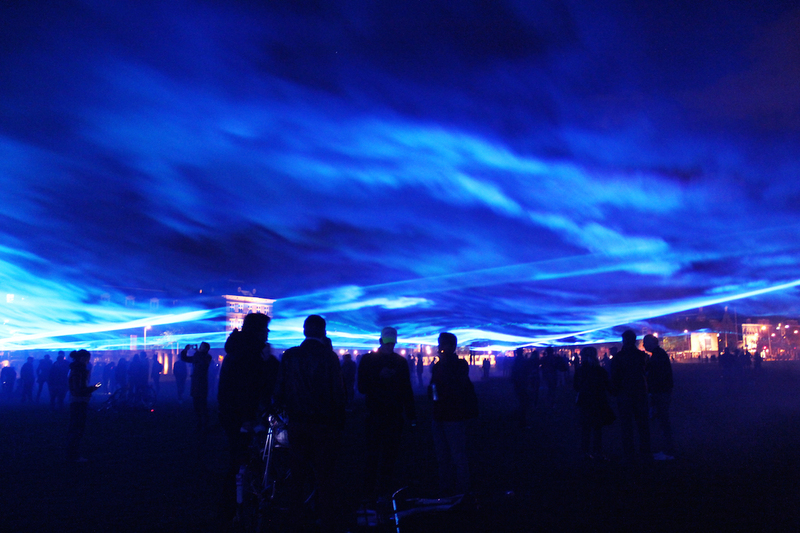 The installation is intended to simulate what the water levels would be like in Amsterdam, had the Dutch not intervened with locks and dikes. 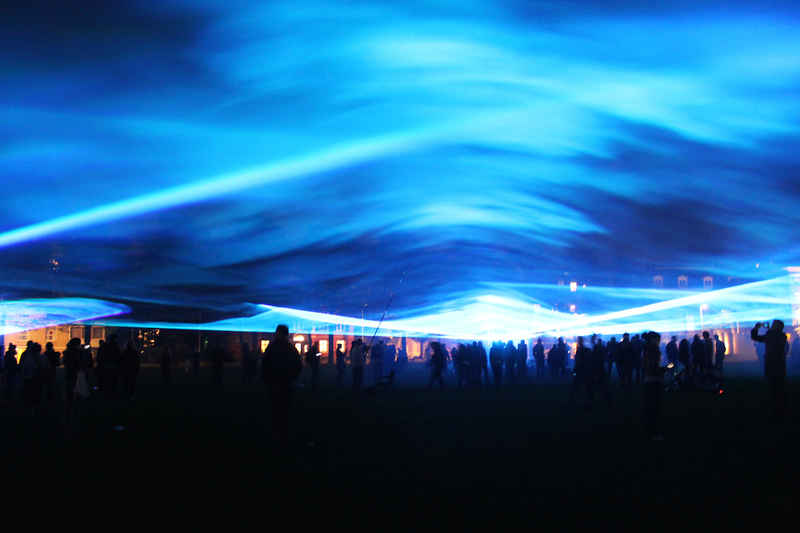 Blue fog was projected into the square, illuminated by brightly shining blue lasers. Standing under the blank of blue, I felt like a giant. The fog created a cloud-like appearance that ebbed and rolled only feet above our heads. The experience was surreal. 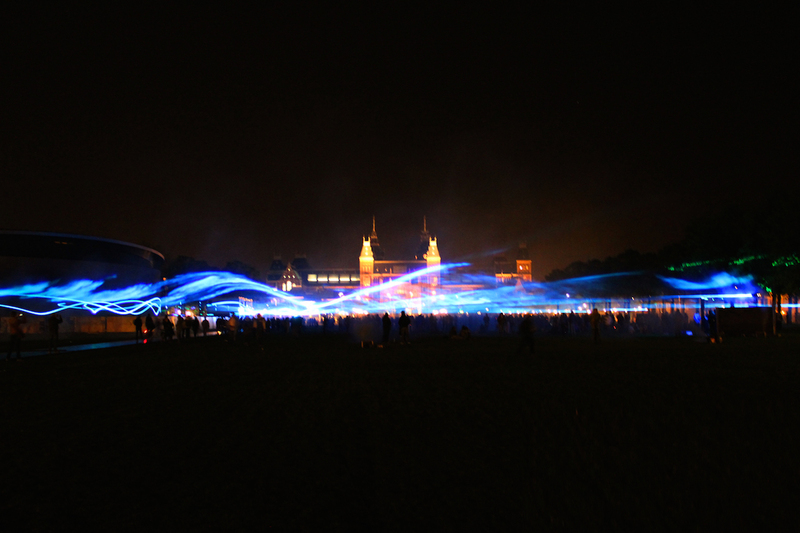 The installation went up last night, and tonight there will be a second showing. 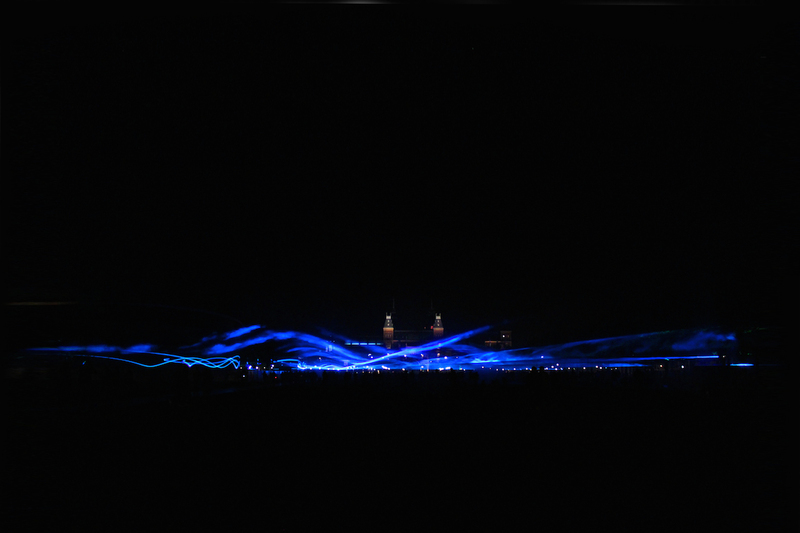 You can catch the lights between 10pm and midnight. It’s one of the most unique experiences I’ve had in Amsterdam in a while, and I highly recommend a visit! I agree – I’m sad it was only for a few days, I want to go back again!! That is beautiful and so cool! Really awesome photos! Love it. Glad getting out of bed on a Tuesday night was worth it. Really nice! He is a nice and modern artist. 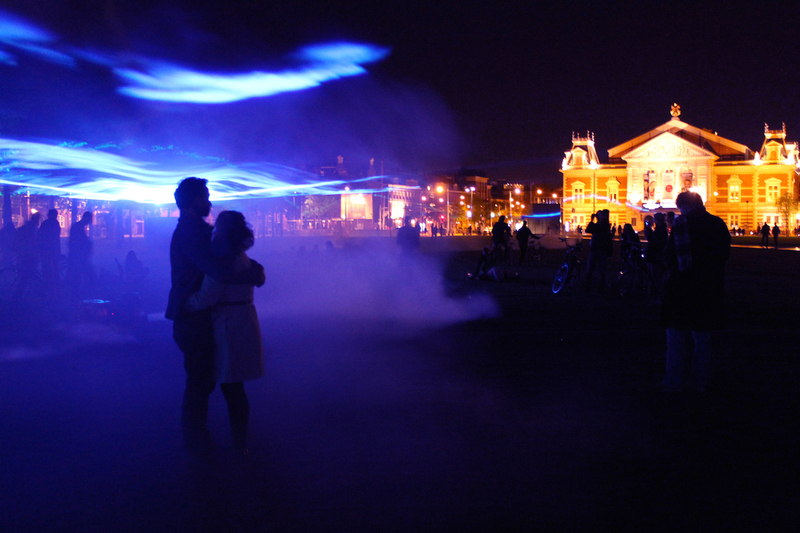 You should check his starry bicycle path in Eindhoven! Why only for two days? This should be there for 2 months or so! Wow, amazing, and what a great idea of the Museum people! And cool pics too!